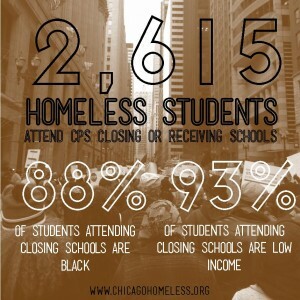 At the close of the last school year, despite protest, community organizing, the advocacy of families, the occupation of schools and the outspokenness of staff, Chicago Public Schools continued forward with its plan to close 49 of its public schools–the single largest sweep of school closings in U.S. history. Only weeks after the heartbreaking decision, CPS announced massive budget cuts for the coming year, ones that target community schools over the expanding charter network. While I was home visiting family this past week, CPS in conjunction with city police demolished La Casita, a grassroots community center attached to Whittier Elementary School in the Pilsen neighborhood. The space was one in which parents and community members had for years been organizing against gentrification and school closings in the area, advocating community-based solutions for combating violence and instituting self-determined educational justice. The last time the building was threatened was in 2010, when protesters kept the land from being turned into a soccer field for a private school. Though after this demonstration local officials had promised to meet with Pilsen residents to discuss the future of the space, and even negotiate city-funded renovations, the center was destroyed in 2013 without notice or consent, and no word has been given about what may replace it. CPS and city officials’ clear agenda is to push the bill for a financial crisis over onto poor, Black and Brown neighborhoods, and to justify gentrification and privatization by starving and intimidating our communities until these seem like logical solutions. Come if you are able, and encourage others to walkout and join the protest!